Congratulations to Jan Love, Kasap Owan, William J. Abraham, and Bill Arnold on their election to the University Senate of the UMC at the 2012 General Conference. GC 2012 has been.... eventful. It looks like the Call to Action legislation will not go through in anything like its original form. In all likelihood some much less drastic changes to the denominational structure will go through. I met with Bishop Peggy Johnson today. She is perhaps our most significant and visible denominational advocate for people with disabilities. United has a new UM certification course in Ministry with People with Disabilities, so some collaboration down the line seems likely. Wendy Deichmann, President of United, has been nominated for a spot on the University Senate. She would be a great addition to this important body of the UMC. Keep her in your prayers and pray for a positive outcome! I have a lot of admiration for N. T. Wright. If you're not familiar with Wright's perspective, this a nice lecture which touches on some of the major themes of his recent work. 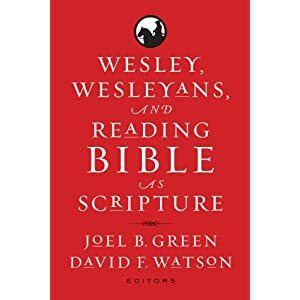 Joel Green and I have edited a new volume on Wesleyan readings of scripture. The idea for the volume came out of a Wesleyan Theological Society conference a few years ago, the theme of which was "The Future of Scripture." 1. Randy L. Maddox, "John Wesley—'A Man of One Book'"
2. Kenneth J. Collins "Scripture as a Means of Grace"
3. Robert W. Wall, "Reading Scripture, the Literal Sense, and the Analogy of Faith"
4. Joel B. Green, "Wesley as Interpreter of Scripture and the Emergence of 'History' in Biblical Interpretation"
5. Reginald Broadnax, "Scripture among African American Methodists"
6. Justo L. González, "Scripture among Hispanic Methodists"
7. Meesaeng Lee Choi and Hunn Choi, "Scripture among Korean Methodists"
8. William J. Abraham, "Scripture and Divine Revelation"
9. Douglas M. Koskela, "A Wesleyan Understanding of the Authority of Scripture"
10. Jason E. Vickers, "The Holiness of Scripture"
11. David F. Watson, "Scripture as Canon"
12. D. Brent Laytham, "Scripture and Social Ethics"
13. Steven J. Koskie, "Can We Speak of a Wesleyan Theological Hermeneutic Today?" 14. Elaine A. Heath, "Reading Scripture for Christian Formation"
15. Karen B. Westerfield Tucker, "The Place of Scripture in Worship"
16. Michael Pasquarello III, "The Place of Scripture in Preaching"
17. Laceye Warner, "Scripture and Evangelism"
The contributors to this volume did excellent work, and I think the discussions therein will make very helpful contributions to the fields of Wesleyan studies and biblical interpretation. The volume probably won't be published until this fall, but if you are interested you can pre-order it. I was recently asked to speak at a conference on human trafficking and domestic violence. Shannon Sellars at United was kind enough to record a podcast of the lecture after the fact. If you're interested listen to the podcast here.